In his home country Côte d’Ivoire the retirement age is 60. The grand seigneur of Ivorian reggae is 62 years old now, but shows no desire to retire anytime soon. 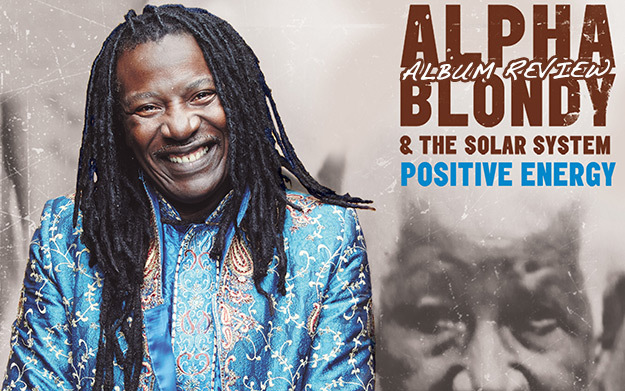 Alpha Blondy keeps on touring the world, working on a variety of side projects, and recording albums. Positive Energy is the 18th studio album of Kòrò Jagger, as he’s affectionally called back home, who started his professional career back in the early 1980s. The twelve-track LP was arranged by the seasoned Ivorian producer Evariste Yacé. As on most of his albums, Alpha himself is credited as the producer, and listed as the composer and author of most songs. In 2011, legendary Ivorian producer Georges Kouakou brought a lawsuit against Blondy in Abidjan to finally get officially acknowledged as the producer and composer of his first six albums. Kouakou lost, much to the dismay of those that know how Blondy works in studio and how the business works in Côte d’Ivoire. Alpha Blondy provides basic ideas to songs, and relies on gifted arrangers and musicians to create his trademark sound. Evariste Yacé and The Solar System do a good job on Positive Energy. Alpha calls his backing band Solar System since his seminal 1987 album Revolution, but its line-up has changed quite a few times since those days. In 1992, right in time for the Masada album, still considered by many to be one of the most important albums Jagger ever released, Ivorian bass player Aboubakar “Aboubass” Coulibaly took over the helm. With him and the crème de la crème of the Parisian reggae scene, seasoned musicians that mostly hail from the French colonies in the Caribbean, The Solar System quickly turned into one of the tightest reggae bands anywhere on the planet. Whoever saw them perform with Alpha in that period will attest to their sheer Spielfreude. In early 2013, most of those musicians left the band, mostly because Mediacom, Blondy’s European booking agency, refused to raise their rather modest fees. It wasn’t difficult for Alpha to find replacements–some of the new musicians had played for him in the past, and others like Jamaican bassist Koxx, a Paris resident, were eager to fill in. Ever since though, longtime fans of the Ivorian legends mostly find that the live experience isn’t quite what it used to be anymore. Blondy mostly owes it to the remaining members of the former line-up–drummer Charly Laubé is still on board, as are guitar player Djul Lacharme and Eddy Delomeni and Vincent Aubert on horns–as well to Evariste Yacé that Positive Energy sounds like any of his albums. It’s not that the new musicians on the team would be substandard, and the pure quality of production of this album is actually better than ever. But the creative sense of innovation that turned even recent albums of Blondy into late high points of his career is absent on Positive Energy. Think of songs like Pinto or Bôgô from the 2011 album Vision that almost reinvented Blondy’s sound. Positive Energy just copies what has been there forever, right down to the order of the songs. That isn’t necessarily bad–it’s just boring. The album starts with Rainbow In The Sky, a combination with Jamaican roots legend Ijahman Levi, who is much beloved especially in France. As is the case with every other combination Blondy has ever done, he doesn’t just invite a guest for a few vocal tracks, but turns the respective songs into actual combinations that incorporate trademark musical features of his guests. Such holds true for Freedom, on which Blondy and Tarrus Riley demand an end to European and American neocolonial rule in Africa. Alpha pays tribute to his grandmother (her portrait graces the cover), who raised him, in Allah Tano, a sung prayer that features Ivorian reggae superstar Ismaël Isaac longside Moroccan singer Issam and Tunisian singer Naoufel. The lyrics are in Dyoula and Arabic. The obligatory rock song goes by the title No Brain, No Headache on this one. Jagger sports some contemporary Nouchi on Maclacla Macloclo, but his own French translation for non-Ivorians follows suit. Madiba M’A Dit (Madiba told me) is a setting to music of a poem written by famous French journalist Valerie Fayolle. The lyrics are overly simplistic, but during a phone call with the author, Alpha Blondy was quick to acknowledge that while there is political equality in South Africa since Nelson Mandela steered the country out of apartheid, economical equality is still far in the future. Lumière (Light) is a highlight of the album, but somewhat diluted by the unnecessary use of autotune. Séchez Vos Larmes (Dry your tears) speaks to Africa’s women, the true force that keeps the continent going. It is Blondy’s second combination with the wonderful Pierrette Adams. Originally hailing from Congo Brazzaville, her powerful Lingala lyrics lift the tune up more than a notch. Alpha Blondy has made it a welcome tradition to reggaelize one classic hit per album. This time, he picked two. The first one is N’Teritchê (My friend), a Mamadou Doumbia classic in Dyoula enriched by Kreyol lyrics provided by Jacob Desvarieux, singer of the legendary zouk originators Kassav’. Doumbia’s song thus gets a makeover that is as much zouk as it is reggae. The Ivorian music legend is, by the way, an uncle of Tiken Jah Fakoly, and he was the first person ever to hand a mic over to Alpha Blondy some time at the end of the 1960s. Ingratitude is another minor beacon on Positive Energy. The second cover is Une Petite Larme M’A Trahi (A little teardrop revealed me). French chansonnier Claude François’ adaptation of this song had turned it into a hit in 1970, and Alpha Blondy had used the song back in High School days to hit on girls. The album closes with Querelles Inter-Minables, a general appeal to settle any arguments. Die-hard fans of the Ivorian grand seigneur will buy Positive Energy anyway. To those new to his music, I much suggest to look to his classical albums first, for Positive Energy is the first musical indication of Blondy’s career that his star is slowly fading. Let’s see whether he turns that around with his 19th album.